With the different variety present, identifying a particular Koi is indeed a challenging task. Knowing the difference between one breed compared to the other, is a very interesting subject to study as it is a form of art that requires deep understanding on how the classification and whole system comes together. Without much experience, most people would say it is a very boring and difficult thing to deal with but for a serious hobbyist, they will simply tell you that it is indeed fun to learn about the fish and what makes up a single class of koi. This part of the article will talk about how to define and gather the fish all into the same group. If you think that trying to make out the difference between a Sanke and Showa koi would be demanding, wait until you come across the Bekko and Utsurimono as they are even more easily confused. Among all the other koi class varieties, sometimes they might actually look more or less the same unless you place close observation. 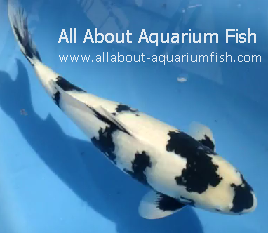 To make things simple and easy to understand, a Bekko is basically defined as a white koi fish with black marking while Utsurimono, the other way round is a black fish with either white, red or yellow marking present on its body but not a combination of black plus with the other colors. What all these basically translate to is that the base color will be the one most profound and used as a guideline to identify the fish while the rest of the colors are only to complement the major ones. Let’s look at the Utsurimono which we shall focus and discuss further in details. The koi as explained earlier is the black carp with combined white, red or yellow. There are 3 possible color combinations here whereby the black with white is naturally called Shiro Utsuri and is the most popular among all while the black with red is called Hi Utsuri, simply means Red Utsuri. The last one called Ki Utsuri is the black fish with yellow patch and coincidentally is one of the rarest and hardly seen even among the Japanese breeders. Shiro is the favorite among all hobbyists due to its perfect color design. Other than bearing a close resemblance to a Showa (provided that you’ve taken out the red patch), the quality of the fish is also judged based on the degree and whiteness of the white color. A high quality type should be a solid snow while a lesser grade fish are those that has the white appear slightly yellowish. The sumi (black) on the other hand must be solid dark and not the type of chocolate brown which is considered less desirable. A good example would be as depicted in the picture on your top left which shows a high quality Shiro Utsuri. All types of Utsurimono are also appreciated based on the presence of motoguro. The only other koi variety that has this special trademark is the Showa. Basically a motoguro is solid stretch of sumi (black) that appears on the pectoral fins and it starts from the joint close to the body and then extending outwards. Unlike the other fish, motoguro can never be found because if you compare a sanke and observing the pectoral fin, you will find and realize that the black color marking only appears as thin stripes. Thus, don’t be surprised that some hobbyist actually define and identify a true Utsurimono based on the presence of motoguro. For a better visualization, just take a moment to view the set of picture shown below. You will see that on your left is actually a normal Sanke fin while on the right is the fin from an Utsurimono which has the motoguro. Utsurimono and in particular Shiro Utruri is also classified and grouped according to the front pattern marking appearing on its head. Some are really unique and special in its own way judging by how the pattern actually forms and develops to resemble certain objects. For instance, one of the most highly sought after among the Shiro Utsuri is the Menware pattern which resembles a lighting strike pattern which is really cool.